Preheat the oven to 350 degrees F. Cream the shortening and sugar. Mix in the bananas. Mix in all remaining ingredients. Pour into a greased loaf pan. Bake 1 hour and 15 to 20 minutes at 350 degrees. 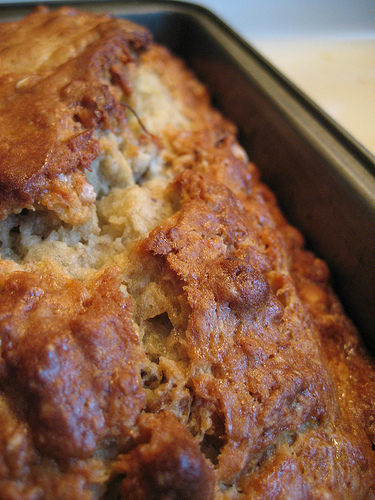 PLEASE NOTE: This recipe makes a heavy, but moist, loaf of banana bread. If you use more than 3 normal-size bananas, lower the oven temperature and cook for a while longer. Otherwise, the crust comes out almost overcooked while the middle remains moist and nearly undercooked.